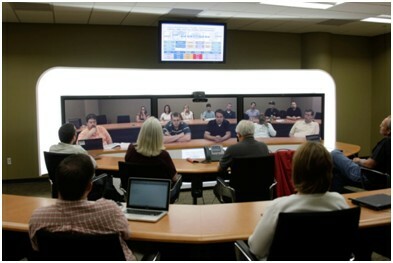 Cisco TelePresence is a new generation of video conferencing technology designed to "immerse" distant conferees by mimicking a physical conference room. Using three 65-high definition (HD) screens, CD-quality audio, pre-positioned cameras and microphones, and similar physical environments (furniture layout, lighting, wall colors, and acoustics), you forget you're hundreds or thousands of miles away from the conferees across the virtual table. Facilitate a collaboration between UM campuses and organizations throughout the world. Save travel time and money, and thus boost productivity. Host up to 18 conferees at each UM site. Interconnect with legacy video (coming later this year). Schedule via Microsoft Outlook calendar. Initiate a conference by clicking a few buttons on a telephone. Display presentation graphics, such as Microsoft PowerPoint, on auxiliary monitors. There is no charge to use TelePresence. If you use audio conferencing to connect non-TelePresence users, audio conferencing charges apply. Schedule your TelePresence conference like you would any other conference room. Go to the Outlook Global Address List and enter "TelePresence MU Ellis Library 106A". Add other UM sites, which also begin with the word "TelePresence" for quick retrieval. Include all TelePresences site as resources. The Ellis Library TelePresence site is permanently locked and requires card access. Pick up the card at the either the north or west main entrances. If you aren't the meeting organizer, you need to know the meeting organizer's name before receiving the card. Please return the card to the same desk when the meeting is over. As the door locks automatically, it's a good idea to leave it pushed open for the first ten minutes of the meeting to accommodate stragglers. If your conference occurs before or after library hours, contact Ellis Library Security at 882-4220 at least three days in advance to make arrangements to open the library. Additionally, contact the Division of IT at least three days in advance for conference occurring outside M-F, 8AM to 5PM. Food and drinks in the TelePresence room are subject to library food and drink policies. Call the Division of IT at (573) 882-5000 or e-mail Division of IT Videoconferencing for more information.